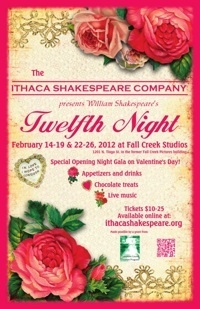 Ithaca Shakespeare Company - January 2012: Twelfth Night! Tickets for Twelfth Night are available now on our website! Seating is limited, so don't miss out on your chance to catch our first production in our new Fall Creek space. Come celebrate Valentine's Day with a performance of one of the greatest romantic comedies ever written! Twelfth Night will open with a special romantic event on Valentine's Day, February 14, featuring live music, complimentary appetizers and chocolate treats, flowers, art exhibits, and more. Bring your Valentine for an unforgettable Shakespearean date night, or just come and cozy up with us and Will. Please help us make the most of our new space in Fall Creek and our upcoming celebration of ten years of Shakespeare in Ithaca! Make a quick, secure donation to the Ithaca Shakespeare Company on our website. Contributions of any size are helpful, and every penny goes toward continuing to improve our programs and offerings. Let's continue building something special together! 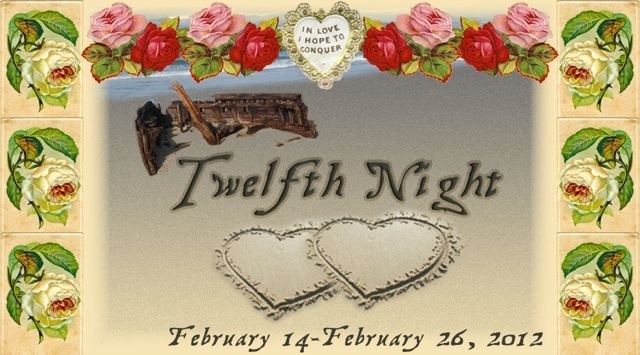 Twelfth Night is Coming February 14th! and a whole lot of smiling! Don't miss your chance to kick off our Tenth Anniversary Season with us and see this first production in our new space! Great news! Now you can package any performance of Twelfth Night with dinner at our next-door neighbors in Fall Creek, Northstar Pub! Get your play tickets and meal all together for one great price! Package prices start at just $26 per person for dinner AND the play! Dinners will include your choice of either (a) appetizer and entree or (b) entree and dessert. Read the Ithaca Times' glowing review of Northstar here.